Shirts With Random Triangles: Eurovision Song Contest Winner Netta Barzilai to performing winning song "Toy" on the "Today" show. Eurovision Song Contest Winner Netta Barzilai to performing winning song "Toy" on the "Today" show. 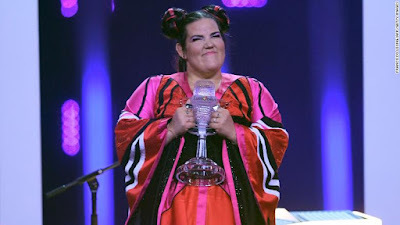 Netta Barzilai. Image via CNN. Get ready for an Eurovision invasion, America! Israeli singer Netta Barzilai , whose song “Toy” won the European Song Contest in May, will perform the song on the Today show on July 24. Netta (which Barzilai commonly goes by) announced the Today show appearance on Twitter last Friday. Traditionally, American interest in Eurovision has been small and focused in the LGBT community, inteest in the contest seems to be growing. The contest has been broadcast by American cable network Logo for the past three years, and actor Will Ferrell recently announced he would be teaming with Netflix to produce a film based on the contest. Previous Eurovision-winning performers who went on to international fame include ABBA, and Celine Dion. As for Netta and “Toy,” the song is also beginning to gain some traction in the US. The song is currently no. 19 on Billboard’s Dance Clubs chart. The song has become notable for its mix of Asian pop beats, quirky pro women’s empowerment lyrics such as “I’m taking my Pikachu home, ” and “buck-buck” chicken sounds throughout the song. 2018 has been a huge year for Netta, who went from winning the Israeli singing competition HaKokhav HaBa, to winning Eurovision. Meanwhile, Israel gets the honor of hosting the contest in 2019. Recent reports suggest Tel Aviv may edge out the nation's capital, Jerusalem to be the 2019 contest's host city.